......, and many younger people spent time searching out details on further study at universities abroad. The above quote is from the article "Cyber cafe deals net customers" by Htar Htar Khin at the Myanamr Times weekly. No doubt many young people want to leave Burma because the economic policy of the current government is not creating job opportunities for young people. We currently have many migrant workers in Thailand. 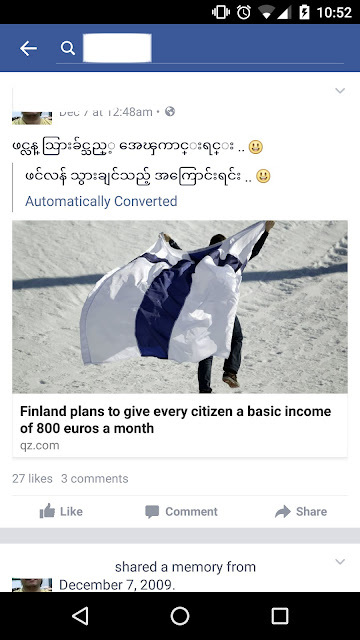 Burmese professionals are working all over the world. I have suffered the last two years in Burma in terms of being ripped of my freedom of speech after enjoying free speech during my school days in the States. If I have to go back to Burma to teach at MIT (Myanmar Institute of Theology) right now, I will think it twice. I know that I am contributing a lot to the youth there. However, I need some money to support my family. I also can't just stand it being denied access to information. The recent salary increase by the government is a good move because it will motivate many people to work in Burma instead of suffering in neighboring countries such as Thailand. I think freedom of speech is still needed for the people of Burma to be happy in their own country. Here is what Dr. Khin Maung Kyi said about Burmese students. It is shockingly true. There are a lot of Burmese students studying at Polytechnic schools in Singapore. The Burmese students don't want to go back home. They want to stay outside of the country and if possible, they would resettle in some developed countries. It is last stage of our national death. Within a hundred years from now, there will be no Burmese. There will be no Shans, no Karen no ethnic races. It is a serious problem--killing historical achievements, traditional knowledge and pride of a nation.